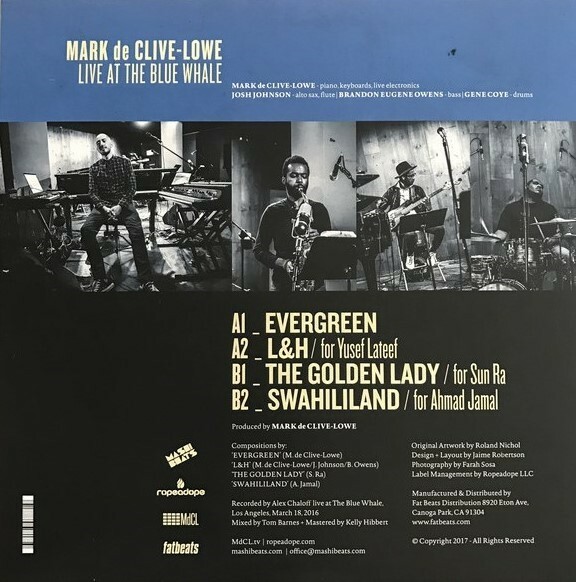 Mark de Clive-­Lowe delivers an outstanding 4 track EP recorded live at Los Angeles' Blue Whale jazz club. The EP finds MdCL revisiting the grand piano, putting his first instrument front and center with his technological world of keyboards and electronics. It's his signature amalgamation of acoustic sound sparring with new technology, joined by a world­-class crew: Josh Johnson (Miguel Atwood-Ferguson / Wayne Shorter) on sax and flute, Brandon Eugene Owens (Robert Glasper/Terrace Martin) on bass and Gene Coye (Thundercat/Flying Lotus) on drums. The instrumental EP opens with an original composition, 'Evergreen'. Solo piano sets the mood as the composition evolves into a head-nodding, beat-driven journey of improvisational conversation. 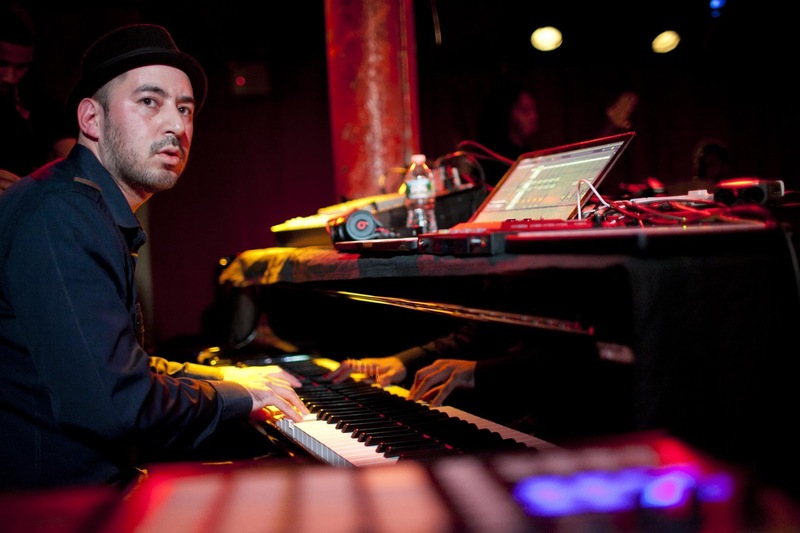 As the music progresses, we hear MdCL programming beats and electronics live and on the spot – manipulating and sampling his own piano, keyboards and Johnson's sax – creating a musical palimpsest inspired by hip hop's sampling aesthetic. Only here, the samples are all organic - performed, captured and manipulated completely on the fly. The following tracks pay homage to three of MdCL's heroes – Yusef Lateef firstly on the loping 'L+H' – inspired by Yusef's 'Love + Humor' with Owens and Coye underpinning the groove while MdCL and Johnson play and become live samples themselves. Sun Ra gets honored the EP's centerpiece – an 11 minute exploration of his composition 'The Golden Lady' – once again, MdCL's piano is the central focus here, leading the way through a mystically evocative soundscape that reimagines the great master. Johnson switches to flute here bringing his playfulness and musical guile to the mix with the piece culminating in an intoxicating blend of beats, live samples and acoustic band. We close out with an interlude of Ahmad Jamal's 'Swahililand' – most famously sampled for De La Soul's 'Stakes is High' by iconic producer J Dilla. It's a real treat to hear MdCL and band in full-­flight live show mode with none of the safety nets of studio production. 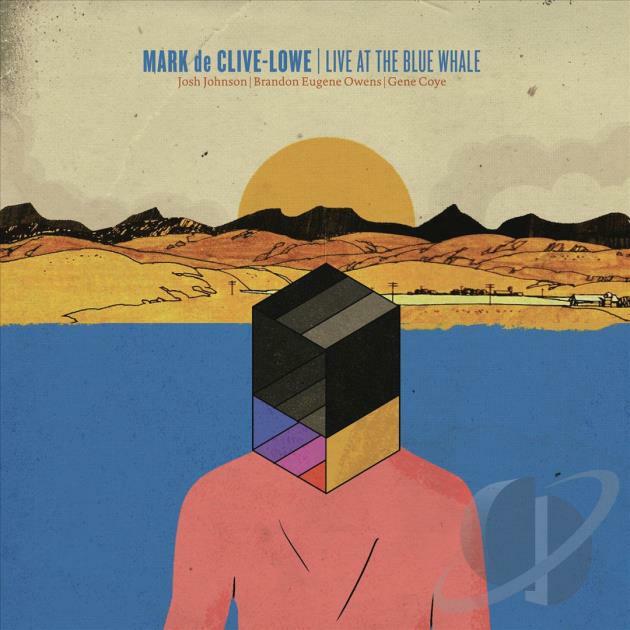 Live at the Blue Whale hints at what's more to come from a truly individual musician.